Have you ever caught yourself wondering how many variations of carpet there are? Whether the answer is yes or no, if you choose carpeting for your floors you’ll have to do some research to guide you in your decision-making. Luckily, a Longwood carpet store has a list and selection of all the styles you might like. There are two central families of carpet: loop pile and cut pile. Loop pile is made of fibers that are twisted and bent into loops. They tend to be very durable and harder to stain. Cut pile is made of yarn tips that are cut and standing upright. Stains and footprints show more with this type of carpeting. This is almost fully untwisted yarn, which leaves a velvety, soft appearance with an upright finish. It’s known for its luxurious look. Something to consider with this style s that it reveals footprints and vacuuming. Saxony is almost identical to plush pile with the exception that it’s a bit taller and the yarn is more wound up. The fibers are densely packed and also show footsteps and vacuuming. A lush carpet style with a more textured finish, cut pile twist is durable and well textured. It’s great for areas with heavy foot traffic and is less likely to display markings of feet or other tacks. If you’re looking for an extremely durable and attractive carpet, frieze might be right up your alley. There are variations in thickness, give a “shaggy” look. Evenly looped fibers create a durable, finished texture that’s great for areas with a lot of traffic. Hallways and landings might be some places to consider using this type carpet. With loops of various heights, this carpet has a diverse look and texture. It’s something to consider for offices and conference areas that get walked on frequently. This is a multi loop pile made in straight rows. There are many options when it comes to pattern and texture with sisal carpets. 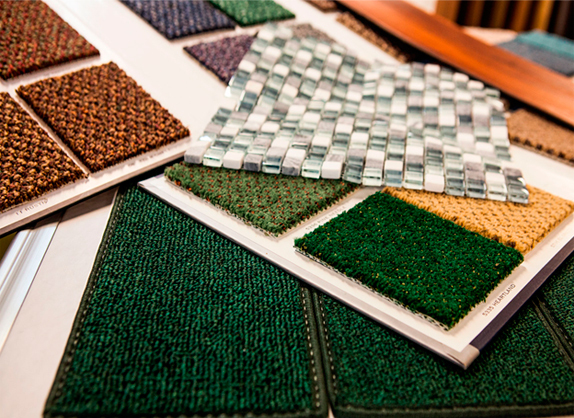 There are undoubtedly plenty of options when you’re choosing carpeting for your home or office. Getting familiar with some of the differences will make your buying process much smoother. If you have any questions there’s a Longwood carpet store with experts who are happy to help. Give us a call or see us in our location to get any carpeting questions answered.